The answer is surprisingly simple: The Code gives us the right. Laura must've felt awfully silly once she realized that. Carebears of highsec, educate yourselves. Otherwise you might end up on the next edition of the Highsec Miner Grab Bag! Anatta Buddhas wrote a confusing EVEmail with the subject heading, "INTELLIGENCE is not be bought". Apparently it wasn't. 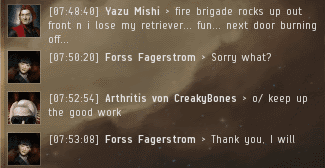 Kudos to Yazu Mishi for inventing a brand-new reason for going AFK in his Retriever: He was participating in a fire brigade to save his neighbor's house. Carebears get more ridiculous every day. Ladies and gentlemen, we are this close to a literal "I was saving orphans from a burning building" excuse! 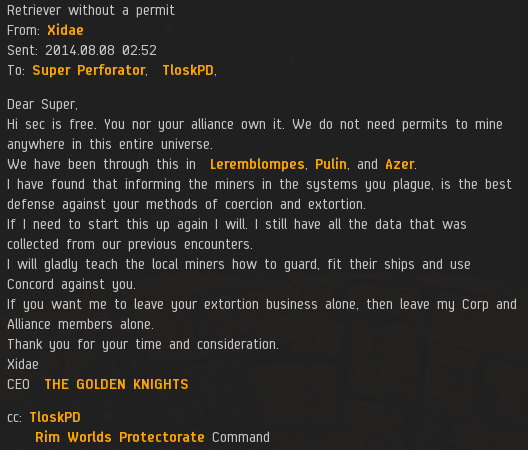 Protip: If you've already been kicked out of three different systems for breaking the rules, highsec probably isn't free, and you probably do need a permit to mine. ...In-game, of course. An in-game broom handle. Rithious Caed complained that "unwarranted ganking" was against the EULA. In case he hasn't noticed, the New Order has gone to greater lengths than any other organization in EVE to explain, document, and justify its actions. If Rithious truly believes enforcing the Code is "unwarranted", then he's right about one thing: No one in his corp knows anything. Carebears love to excuse their own bad behavior by pointing to someone else's bad behavior. Botting is against the Code, yes. So are a great many other things. If you habitually violate one provision of the Code, don't consider yourself better than someone who violates another. Reice Wolfclaw longs for the good ol' days, before the Code, "a time when you were free to do whatever you wanted in highsec". Yeah, I remember those days. It was a frickin' nightmare. In other words, he was upset for no good reason. Maybe it had to do with something out-of-game. Perhaps his house burned down because the members of the local fire brigade were all at home in front of their keyboards like they're supposed to be. Every carebear has his own opinions about what is and is not appropriate behavior. For example, Baarrff feels it's acceptable to use racial slurs--as long as they're deployed in the proper context. Another situation in which Baarrff feels comfortable with racial slurs: When there's no other word to describe what you're talking about. Here we see the dangerous consequences of a carebear's limited vocabulary. The truth is, when every carebear is allowed to behave according to what's right in his own eyes, highsec is doomed to chaos. It's impossible to build a civilized society upon the foundation of a million different moral standards and philosophies. Everyone must be made to follow one standard. Fortunately, there is a singular standard by which everyone in highsec is judged. It starts with a "C" and ends with "ODE always wins". How come almost all of these are from last month....one is even from last year?! I would think with everything going on, there'd be some recent material? This stuff gets backlogged and filed away for future use. The problem is that there is just so much material that the new stuff isn't used up until the old stuff is. I assure you, gentle anonymous commenter, there is no shortage of tears from hisec miners. It really is a shame that people like Baarrff aren't banned for that despicable language. Whoever thinks that's an alright thing to say to another has no business in our gaming community. They get banned, but first people have to actually open support tickets on them. The list of "Anti-Gankers" who suddenly don't feel comfortable being racist and homophobic in local chat these days is proof positive of that. Just like you can't win if you don't play, CCP normally can't do anything unless people report it. Quick! Post all his info on the Eve-O forums! Nothing bad will happen, I swear. Enjoy - using this information you can find out my closely guarded secret that no one in game knows - I'm from the United States and live somewhere in about 60 miles of my ISP. Priceless, DJ, yours is the voice of Reason! So DJ is from Texas. No, I am not from Texas. I travel quite a lot due to my job, and once in a while I spend some time in Texas. Today - I am in California. You know what they say about Texas don't you? It's just Veers with Queers. 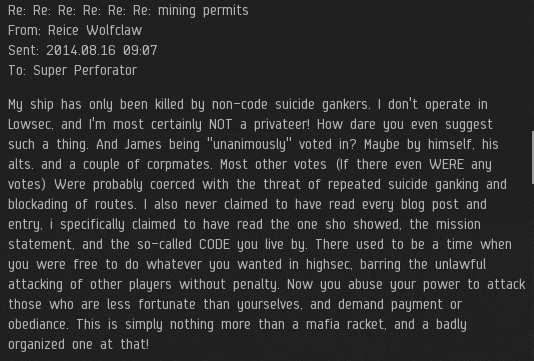 I like the "We don't need permits to mine anywhere in this universe" person. Guess how long your mining ship would last if you mined in one of my alliance's systems without permission? Or is Highsec the entire universe for this guy? This all makes me sick. I vow to defeat the New Order and all Goon scum. You're all sociopaths. There will come a day when highsec is 100% safe and a new Brotherhood, a new Band of Brothers, will defeat Goons once and for all. Order will return to the universe and all will be right yet again. Safe Trade hubs will emerge in nullsec and all will be welcome, except the Goons, their Code puppets, and other cyber bullies. But this monumental undertaking will require lots of isk and lots of players. If you would like to join me to banish the evildoers, x up in this thread with your in-game main character, and I will have a brother reach out to you to get this ball rolling. To the end of tyranny! "This all makes me sick"
As a Doctor I'm here to help. Many people ask me "why my ship blew up?" My answer's always the same: "No permit, no ship". So to assuage your rage dear Anon 8:52, I prescribe a bucket of permits. That should wipe the tears from your eyes. Any of our Agents will be happy to dispense the necessary medecine. A brother will be in touch shortly, thank you Scotter McCabe. Who else will join us in wiping out the Code and Goon menace? In time. Highsec is full of players who despise the New Order and Goons. It's just a matter of rounding them all up together under competent leadership. For their service to the brotherhood, they will be showered with riches upon completion of our objectives. But first comes sacrafice to the brotherhood. The day will come where our fleets outnumber theirs. Even if it takes years, we will do it. Rise up against tyranny, be part of something amazing, and flush evil from the universe. X up to make history. I won't reveal my secret plans just yet. I have nasty surprises cooking. I see this going places! I SHALL JOIN YOUR NOBLE CRUSADE AGAINST ALL THOSE WHO OPPRESS THE UNWASHED MASSES IN HI SEC! "...In-game, of course. An in-game broom handle." As for DJ and his specious claims against me - that I don't create content, blah blah blah. Suffice to say that I agree with Ripard Teg http://jestertrek.blogspot.com/2014/03/the-bonus-round.html - "So, how does CCP respond to this vile human being? I can tell you that if I were in the position to make a decision about this person, I would seize his assets, permanently ban his accounts, and I would then go to work on his buddies with asset seizures, negative ISK balances, and temporary bans. I personally believe there is absolutely no place in EVE Online for this level of depravity and evil. To date, CCP has chosen not to do that. Sooner or later, they're going to have to decide, though: is this the sort of thing they want going on in their EVE?" DJ Exhibits the same vileness and fundamental depravity, the same sick desire to engage in emotional torture, and the same complete lack of any functional system of moral values. To wit, a true CODEie, a true Goon, a true barrel feeder. I thought you didnt support the ero ban? Is this a fake Veers Belvspar? Belvar...except that the Jerkster's Truk ground to a halt and he retired, shamefaced and defeated. First you say you don't support the banning of E1 and now you do. Do you suffer from multiple personality disorder Veers? Yes, I opposed the banning of E1. This does not change my view that his actions were deeply immoral and wrong, and below any level of acceptable conduct. This does also not change my view that people who STILL defend what he did, like DJ, are a stain on organized society. 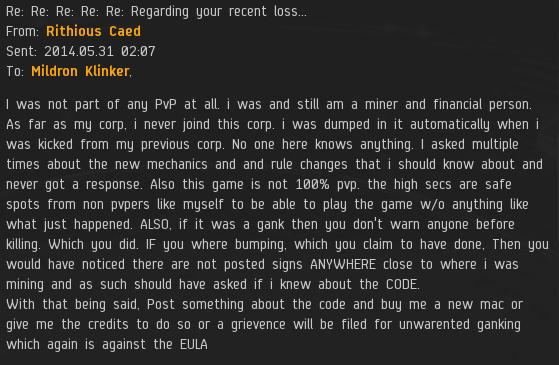 My position is that instead of coming down on a random victim or two, CCP should officially ban all scamming - isk doubling, ponzi schemes, etc... That way all the scammers are on notice, and any violators can then be properly banned. This will naturally lead to the end of "bonus room" type events. And the fact that Ripard Teg got bored of writing a blog is hardly much of a "defeat." Or is the fact that James 315 never shows up anymore a defeat for him? YES BAN ALL SCA;MMERS; BRING THEM TO IFANFEST FOR GOOOD STONING LIKE BIBLE: THEUY AR ALL TERIABLE PEPLE AND NEEED TO PAAAAAAAAAY!!!!! CONTINUDE.... AND BAN ALL COD PLAYERRS 2!!! I PRINTED COD E TO WIPE MY BUT; PAPERKUTS WORTHIT!!!! I make $500/hr defending sociopaths and sickos like the New Order and E1 everyday. But in a video game I play to relax, I want them all banned so we can play in peace. Eve is no place for such people. I've decided that blowing up internet spaceships makes some people sad, so I'm giving that up and CCP should go ahead and ban that as well. Only mining and industry should be valid gameplay. Veers Belvar for CSM 10. "Bro" stop hating on me Loyal. I have used my high dollar lawyering skills to craft the below evemail. Send it to everyone you know and everyone you don't know. Special shoutout to Chribba for helping me program my special evemail tracking system for my campaign for CSM 10. My name is Veers Belvar, and I'm running for CSM10. In game, I am a space lawyer and real life lawyer to the rich and famous. I buy 1000's of PLEX a months just to buy bling to get blown up each and every month. Today, I have decided to run a special program to give back and to spread the word about my candicacy for CSM, running on a platform of anti-scamming and anti-Code. And I'm going to pay you to spread the word, just like my forefathers used to buy voters drinks at bars. Send this evemail to all of your friends and corpmates. Copy me in on each and every evemail so I can track with my special tracking program. For every recipient of this that you send to, I will pay you 10 million isk. That means for every 100 friends, you'll have a cool extra billion sitting in your space wallet. Send each of these an evemail with me, Veers Belvar, copied in. Also send each 1m isk. They will each respond with a secret. Evemail me the secrets and I will send you 100m isk. AFTER you have evemailed the 10 on the list, but BEFORE you evemail all your friends, be sure to move everyone down a number and replace #1 with hour character name. If you already sent, that's okay, just send it again properly. This step is CRITICAL to keep my tracking program running optimally. Be sure to copy and paste the template instead of simply forwarding so the formatting remains intact. If you send this to 100 friends, and they send to 100 friends, and so on, you will become spacerich like me. Together we can stick it to the scammers and CODE and ensure victory. If you do not send this evemail, you will be harboring scammers which is almost as bad. You will go to HELL and I will cross reference those that DID stick it to the scammers by participating against the master character list, and I will suggest warnings for everyone who doesn't help us vanquish EVIL. Also, I will ensure everyone gets a bonus Ishukone Watch Scorpion upon my CSM chairmanship. Look at them in market and imagine one in YOUR hangar! Together space friends, We can do this! Dumb post..too much work...and i only even know #1, #2, and #8 on your list. Try to come up with a better list next time, buddy. My guess is this is what happens when you are in favor of banning content creators. They make you the content and continue on. I'm sending this to all the carebears I come across. 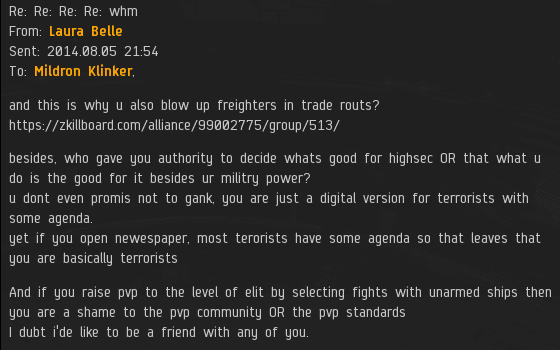 Bro, I'm not part of a nullsec alliance, and I will not be running for CSM 10. Keep trying though. And as far as banning, Loyalanon and John E Normus banned me from the in game code channels, they are the banners here. o/ Veers, you can't back out now, the campaign is just beginning. "I make $500/hr defending sociopaths and sickos like the New Order and E1 everyday. But in a video game I play to relax, I want them all banned so we can play in peace. Eve is no place for such people. I've decided that blowing up internet spaceships makes some people sad, so I'm giving that up and CCP should go ahead and ban that as well. Only mining and industry should be valid gameplay." It is the victim mentality of people like Veers Belvar that ruin the game for the rest of us. I enjoy the excitement and work survival requires in Eve. If it was ANY safer, it would be pointless. Fly reckless, because flying safe is do damn boring.